Appleton has expanded its popular U-Line series of electrical receptacles to include the industry's first Class I, Division 1 and 2 portable receptacle/GFCI combination. 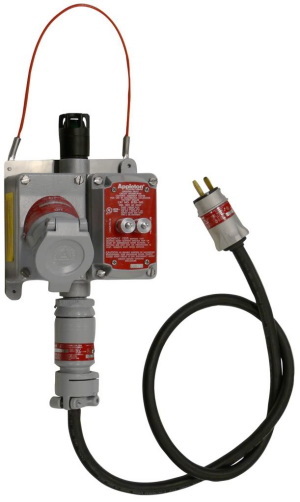 The company's U-Line 125VAC portable receptacle and GFCI delivers open neutral protection to protect plant personnel against the risk of electrical shock, while also safeguarding the connected apparatus against damage from short circuits and current overload, Appleton says. Engineered to safely work in environments classified by the National Electrical Code as "hazardous" due to the presence of explosive liquids or gases, the combo also meets all UL and CSA requirements for non-hazardous locations, including marinas, docks and other wet applications, the company says. A highly visible pilot light indicates the GFCI is engaged and that the receptacle is ready for use. Pilot lights are available in green or red, LED or incandescent.